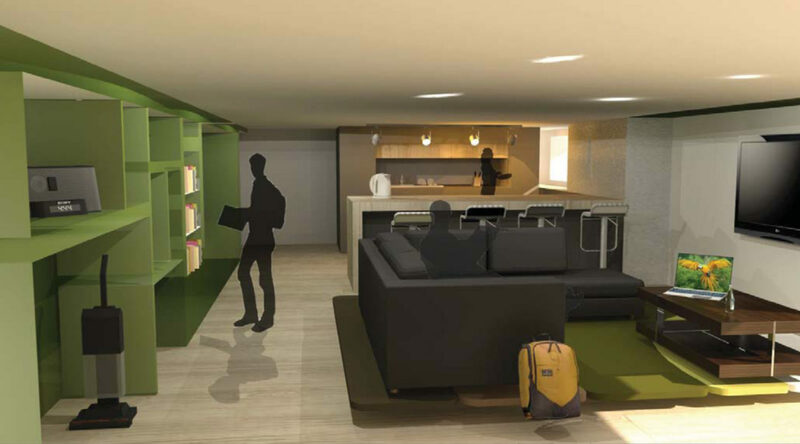 If students designed their own living space from scratch, what would it look like? And what can we as student accommodation designers learn from their ideas? Students were asked to design a new type of student living space, using an existing ground floor flat on campus as a basis for the design. The flat is operated by UPP in partnership with the University and the students discussed their proposals with the on-site management team at each stage of the process. For the students it was an opportunity to develop their design skills on a project with ‘real clients’ and draw on their own and their friends’ personal experience. For Willmore Iles Architects this project has been a fascinating insight into what current students ideally want from their university living experience and the priorities they place on their work, their social life and their health and wellbeing. In this paper we explore these four themes, through the student’s projects and discuss their implications for the design of student accommodation in the future. 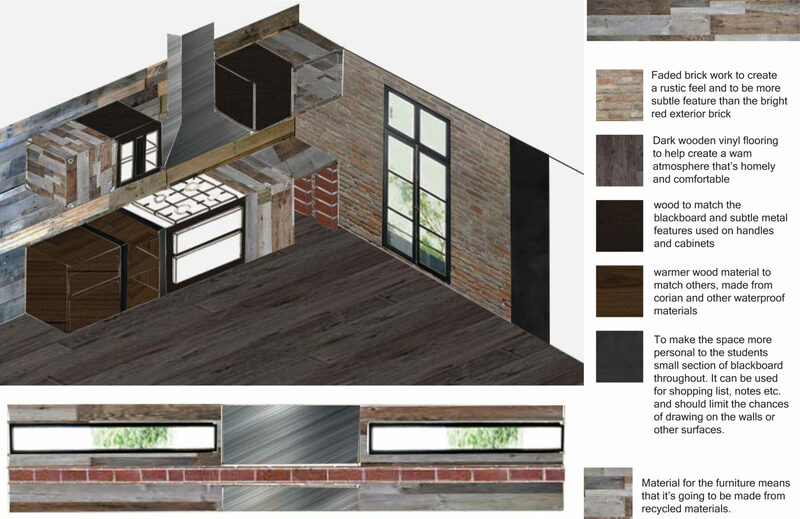 From September to November 2017, eight second year Interior Architecture students and their tutor, Jonathan Forster, from Plymouth University worked with experienced student accommodation designers from Willmore Iles Architects and University Partnerships Programme to develop a design for a new type of student living space. To understand and develop their projects, the students used mainly qualitative research methods. At the early stages of the project they interviewed friends and colleagues, carried out analyses of the use of existing spaces, talked to people at UPP who operated the accommodation and interpreted the results through the lens of their own expectations and experience. Students also carried out a level of research into the current state of university accommodation across the UK. The group included two students from the USA on an Erasmus year. They injected the experience of their time at university in the United States into the group discussions and ideas. 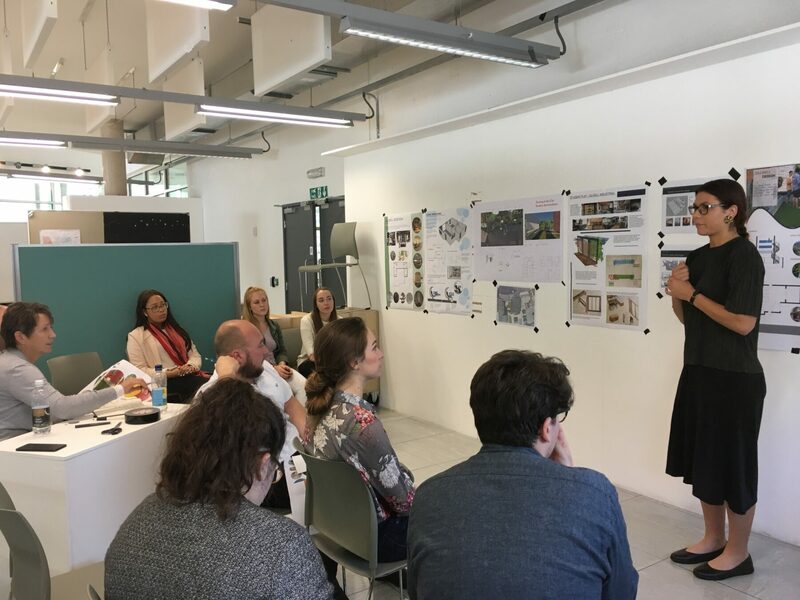 During the development of their ideas, the team from Willmore Iles Architects and UPP held a series of workshops with the students to discuss proposals and input external advice. Right from the start of the project it became clear that students wanted to tackle the big issues around living and learning at university. They were keen to consider how their designs could be developed to help facilitate a positive university experience. 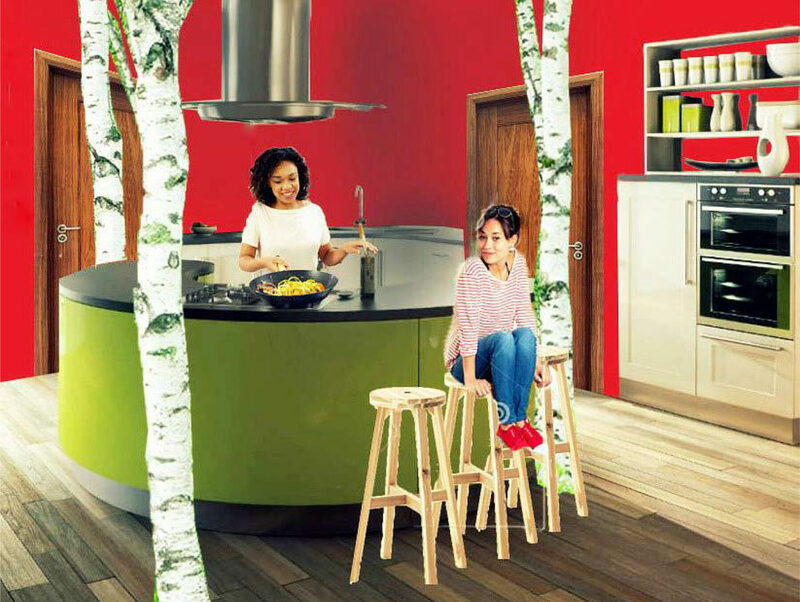 When designing living spaces in student accommodation, the brief is not to create a permanent home. However, there is strong anecdotal evidence that it is important for students to feel like their living space is a ‘home away from home.’Our students’ designs for their ideal living space reflects this desire. this to a shared identity as part of their flatshare. This helps them to feel ownership of the space so it seemed like home. Dr Paul Keedwell’s in his book Headspace: the Psychology of City Living, considers the nature of home and identity. Home is not only an important expression of identity, it also helps us to remember who we are. is a key part of a successful transition to university life. Even though as a student you are only living in a ‘temporary’ home, like a home, there still needs to be a feeling of security engendered by the space, for it to work. Keedwell would argue that these places should not just be functional but represent our unique personalities and interests. A strong desire to imprint individual identity came through in several of the student projects, looking at the opportunity to personalise their space, from providing blackboards for writing on, to considering how the materiality of the spaces. Cara’s project focused on a design that said something about who you are. In a student flat the identity of the space cannot be built up over years of collecting objects and memorabilia, but it could reflect a certain style or statement that you might chose to identify with. She chose to follow an industrial live / work created using natural, textured materials such as bare reclaimed bricks and recycled wood. Morgan’s project looked at the opportunity to support both individual and group activity within the flat. He wanted to provide a series of linked multi-functional spaces that supported this approach and achieved this by introducing a strong architectural element within the space in the form of a free-standing wall / divider. This one element allowed a series of multi-functional uses, from dugouts for study space, to group storage and display spaces, bookshelves and pictures. It created a space with a strong group identity, alongside the opportunity for individual personalisation of the spaces. 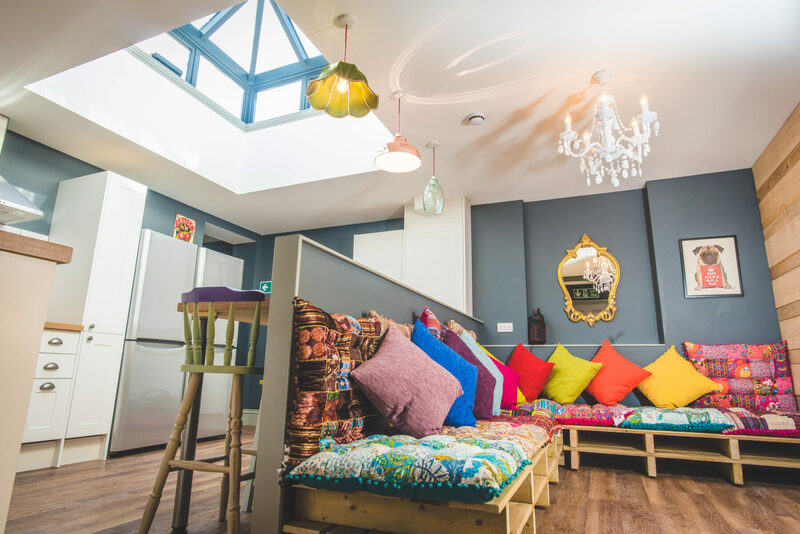 Whilst not expressly referred to by the students in their projects, they clearly felt that an element of individualisation was important to creating a home away from home. for example, and within the shared flat space as well. The opportunities for creating a home can include an interior design approach which actively promotes a ‘look’ that appears to have been developed over time. Willmore Iles works with a client, Campbell Property which specialises in operating student flats for second and third year returning students. 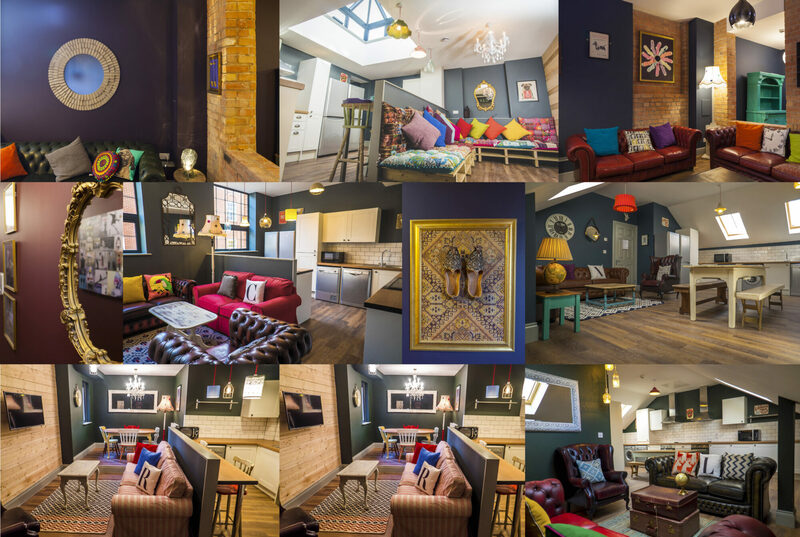 Campbell Property has taken this idea of creating a very particular flat identity, and use themed artworks and carefully chosen fixtures and fittings to create a home from home environment that students love. The living rooms include mismatched chairs and cushions and quirky furniture, all to reinforce the idea of a series of objects collected over time to create a home. All the students involved in the Home from Home project recognised the importance of meeting people, making friends and building networks. This allows them to secure housemates for their second-year accommodation and seek support for a wide variety of needs including their course, sports and social clubs and non-academic concerns. The group included two students on Erasmus from the USA and their take on making friends provided an interesting insight into a different culture and different expectations of the student experience. ‘In a shared room you have an ‘instant friend’. 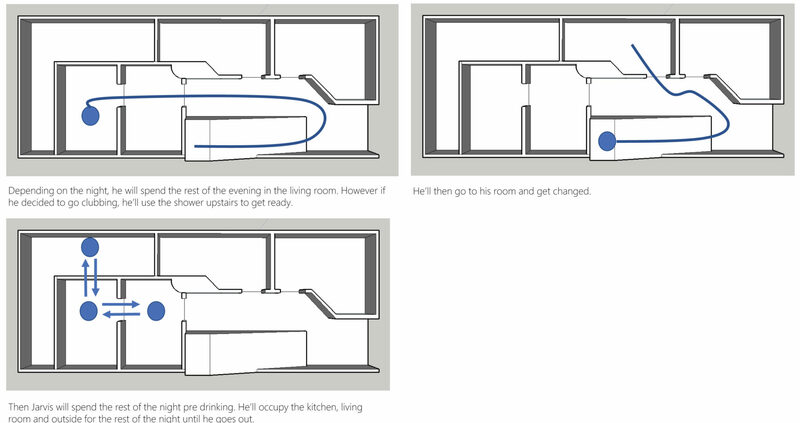 For this project they wanted to look at increasing the opportunities to meet and interact within the flat. Madeleine found that many of the students she spoke to felt that their accommodation lacked a place to socialise and this made it difficult to make friends and left them feeling isolated. Her project aimed to create this space using the American cultural norm of sharing a bedroom and considered through the lens of Japanese design. The proposals aimed to maximise the space for socialising and gathering within the flat, with the option of privacy when required. She described to us the cultural significance of going to university in America. Sharing a bedroom is the norm, many people contact their roomie on social media in advance of the start of term and some even discuss and coordinate colour themes and duvet covers in advance. People expect to go to university, make lifelong friends, meet their husband or wife to be and come away with a top grade degree and the promise of multiple job opportunities in the future. No pressure there! There was a strong consensus amongst the students that affordable accommodation was important and if they had to prioritise space to achieve this, they would prefer to have smaller more compact bedrooms with the space saved reallocated as living space. They wanted linked flexible living spaces where there was a potential to remove what they saw as ‘designed in barriers’ in their existing accommodation and allow better flow through the flat. They talked about the design maximising the greatest the opportunity for interacting with other people and that this should be balanced against the need to find sanctuary and a quiet space to think. This balance supports students buying into whole ownership of the flat and as a result, the creation of a home from home. Her research led her to look at all the activities that take place within the flat and assess whether they sat within the private or social space. Her aim was to increase the amount of social interaction within the flat. Her scheme took the activities of washing and teeth cleaning and moved them from the private space to a shared space. So she retained individual bedrooms but socialised a part of the usual individual activity. This was an innovative way of creating interaction through activity as well as space. Her idea was that this would provide a way for flatmates to communicate during the morning getting ready time and the evening wind down time. In discussions, this felt like a ‘festival living ‘approach which would appeal to some students. Her bedrooms too, were more compact with roll down shutter doors which could be open for talking or shut down for privacy, providing a clear demarcation of private and social space, with built-in flexibility. I want to increase the amount of social integration within the flat - so I took the activities of washing and teeth cleaning and moved them from a private to a shared space. Morgan’s project focused on the idea of delineation of space from the private to the public within the flat. His primary research looked at how students use their flats on an individual and group basis. 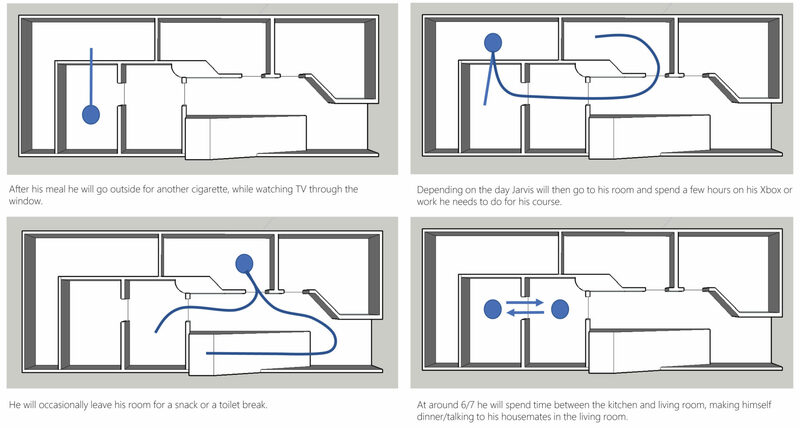 He mapped a day in the life of his friend Jarvis and the data he logged, whilst showing the individual’s particular interests, also allowed Morgan to draw some more general conclusions about how important the living spaces were in the flat. The main activities engaged in on an individual basis were eating, sleeping, doing chores and relaxing, whereas group activities included gaming, watching TV, movie nights, sports, cooking and board games. He developed a specific design element into his flat, the ‘multifunctional wall divider’, which provided the opportunity to delineate between private and social spaces and allowed free flowing movement through the flat. Corridors and doors having been removed where possible. 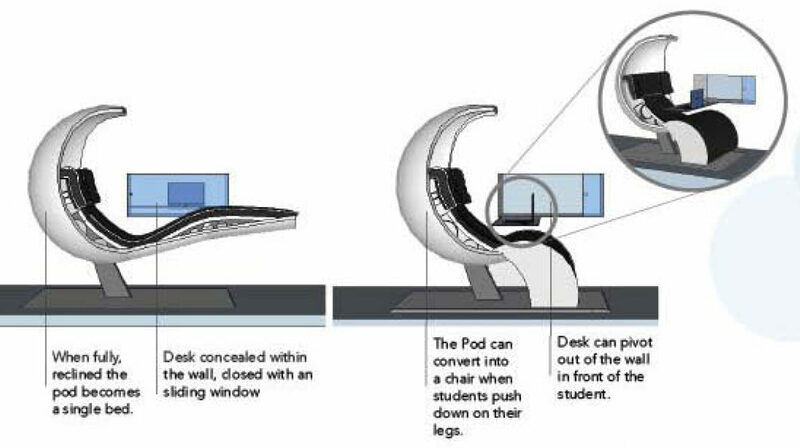 It also gave the opportunity for the creation of study / social spaces in the wall dugouts. 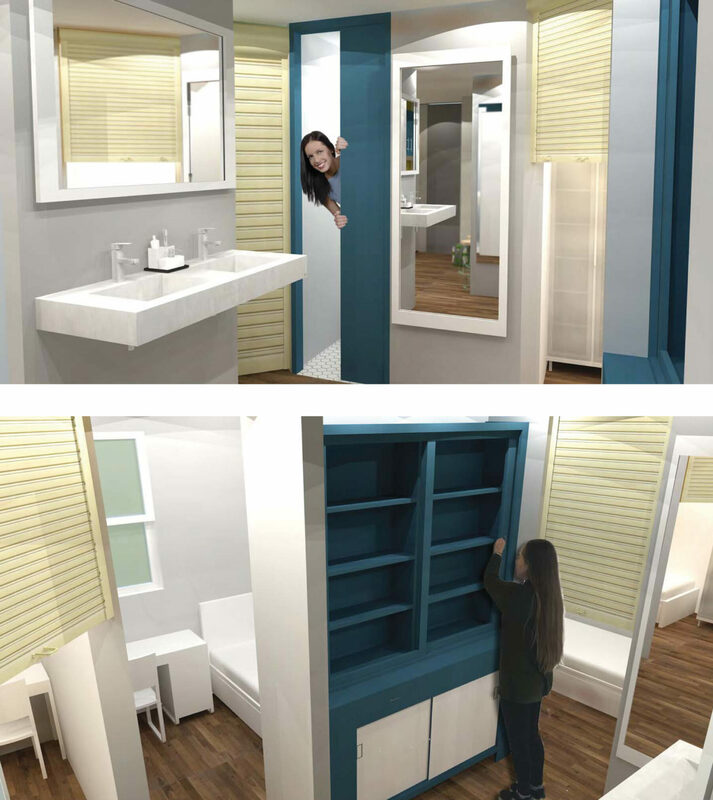 Shannon’s project took the idea of compact sleeping space and, using the design influence of the Japanese ‘kapuseru’ capsule hotel, developed a ‘bedroom pod’ for the flat. The aim was to enhance and focus the remaining space into the social areas. Along with a clear emphasis on more compact bedroom spaces and the flexibility to open up or close down these spaces, we would like to introduce the idea of shared washroom spaces. This wouldn’t work for all, but for some it could prove a very successful way of fostering a home environment (fighting for the bathroom :). 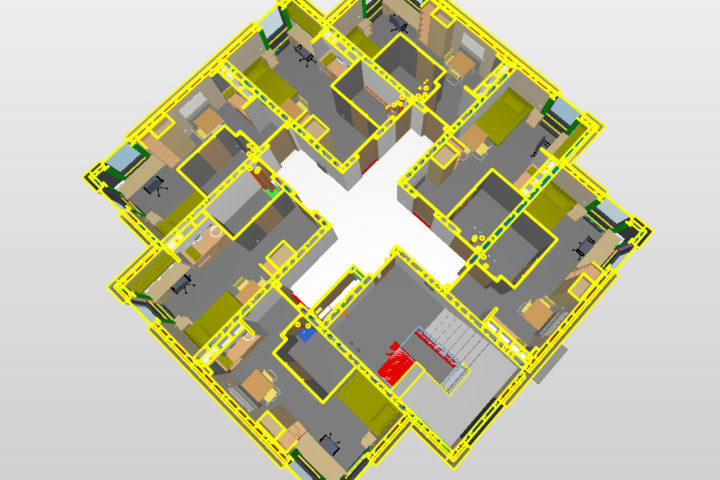 Technical constraints have historically led to cellular-type solutions for the design of student accommodation. 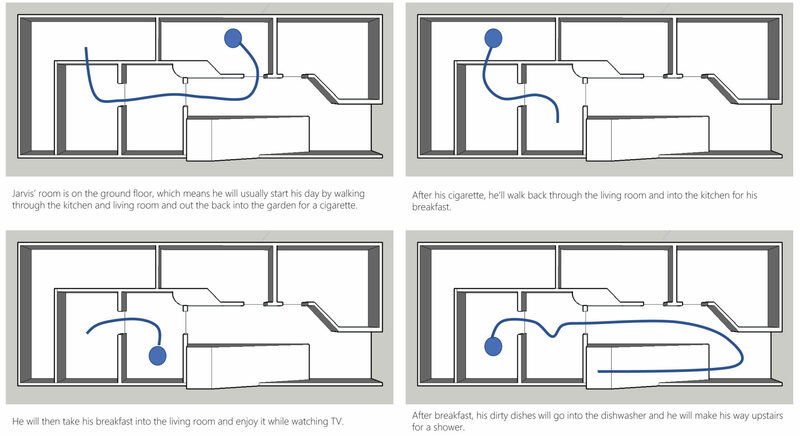 Whilst safety of users remains paramount with new requirements around fire strategies, it gives the opportunity to design more open social spaces at the centre of the flat or house. We should look at creating flow between spaces, rather than barriers, and introduce a variety of social spaces, like the shared study area or the central cooking area. The students were all very aware of how their general wellbeing and health could affect experience at university. We discussed how important the students’ living and working environment was to their state of mind, health and general well-being , and how it therefore played a large part in whether their time at university was a positive experience and led to a successful outcome. The work of biologist E.O. Wilson looked at why we are so drawn to living things and want them around us . These studies suggest that the simple introduction of views out of their living spaces to plants and nature may actively improve the students’ focus and concentration and thereby their living and learning experience. Finlay looked at the opportunities to creatively incorporate plants within the flat. 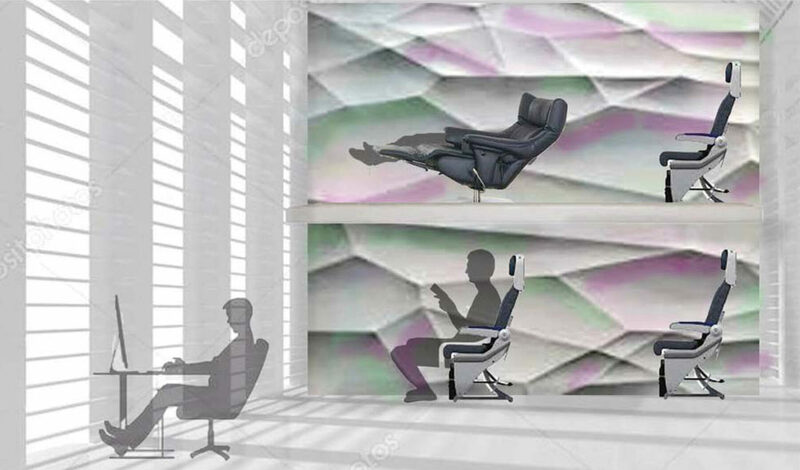 He proposed an ebb and flow hydroponics system that could be used both on the ceiling in spaces and as part of a screening system for flexible living spaces. He also looked at growing herbs and salads, against some background planting, that might actively be used by the students in the flat and their neighbours. Alicia chose to extend the existing flat area to create two different external spaces that were linked to the living area. Garden 1 is an external space to be shared with friends and neighbours from flats on the upper floor with grass, planting and a water feature. Garden 2 is a retreat space, external but enclosed, just for those people living in the flat where they can sit in quiet contemplation, created using natural tactile materials such as timber and cork and incorporating some natural planting. Tereza’s research led her to consider the communal space within the flat. She felt strongly that a space with no sense of ownership became noisy and dirty and was a significant negative impact on the life of the students living there. 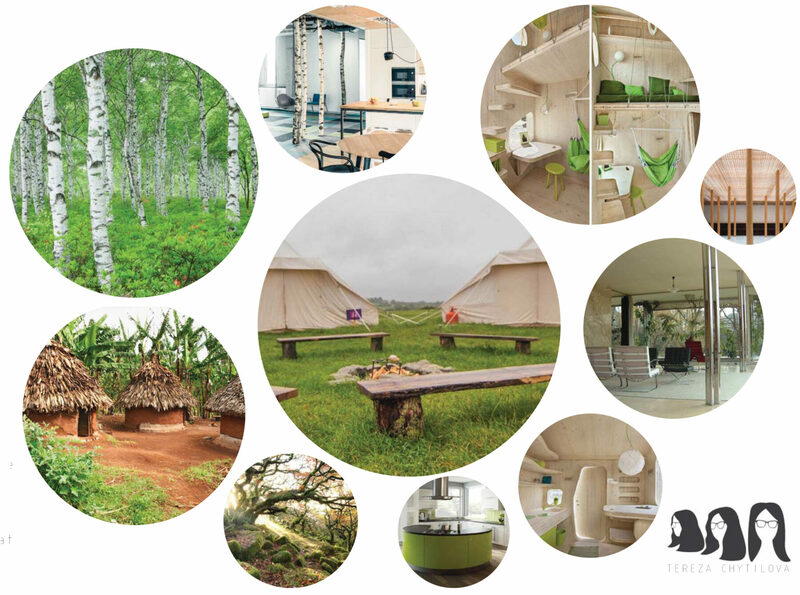 Her inspiration came from the forest and camping in the woods, with examples of people building their dwellings or pitching their tents in a circle with the entrance towards the middle. When designing student accommodation we are becoming increasingly aware of the positive impact good design can have on student health and wellbeing. 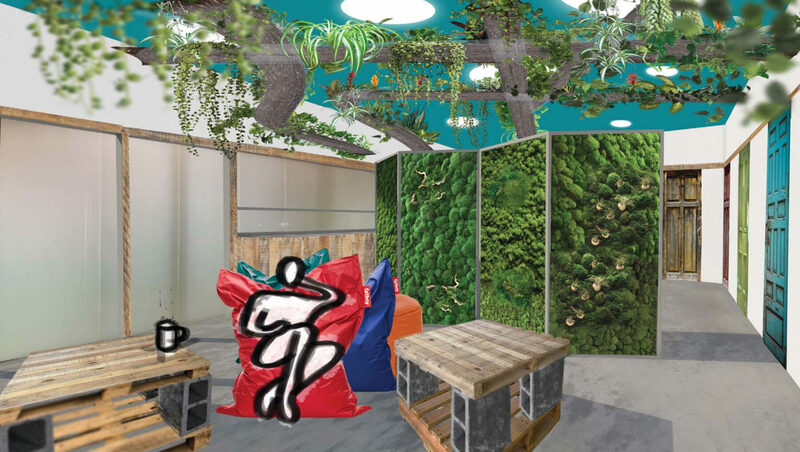 Student accommodation schemes should consider the introduction of nature into spaces, either by utilising views within a site context, or if in a very urban environment, by the introduction of plants and landscape imagery into our proposals. Very often outdoor spaces are sterile ‘leftover’ spaces and don’t make it into the final construction budget. This needs to change. 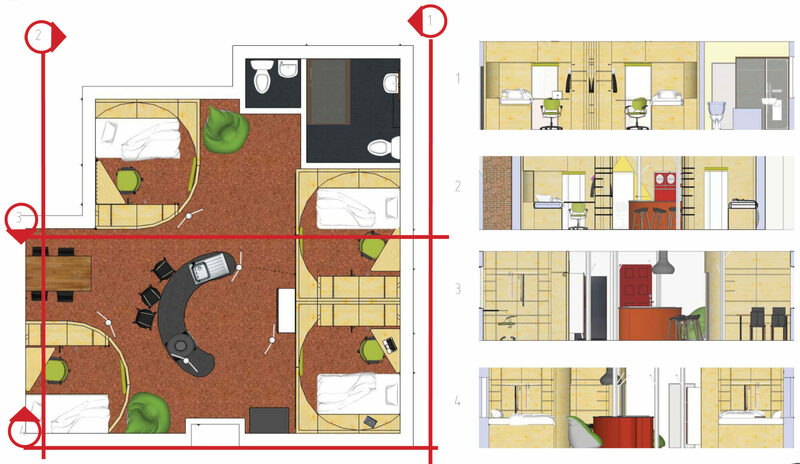 Smaller more compact ‘capsule’ bedrooms with the space saved reallocated as living space. Linked flexible living spaces where there was a potential to remove ‘designed in barriers’ and allow better flow through the flat. Open social spaces at the focus and entrance to the flat or house. These ideas and the four key themes from the research will resonate for all involved in the provision and use of student accommodation. If done well, these ideas will provide student residents with the opportunity to build for themselves a home away from home, and this will in turn support them in creating a positive university experience and outcome. Paula is co-founder and practice director at Willmore Iles Architects. She has spent the last 19 years working with clients to develop student accommodation and residential schemes around the UK. Simon is an Associate who specialises in student accommodation for returning students. Desor, Janet, A. Toward a psychological theory of crowding Journal of Personality and Social Psychology 21 (1) 1972 p 79. Gosling, SD, S.J. Ko, T. Mannarelli and M.E. Morris A Room with a Cue: personality judgements based on offices and bedrooms Journal of Personality and Social Psychology 82 (3) March 2002 p 379-98.